After I resolved the issue of not having a monitor stand wide enough for my new laptop computer, I had to address the next item on my to-do list: building a proper acoustic screen to reduce extraneous noise when recording audio. A major responsibility in my work is creating online training materials. One part of this is recording the narration that accompanies the training. The condo unit I use as an office has concrete walls and ceilings and a tile floor. From an acoustic perspective, the room is very “live”. 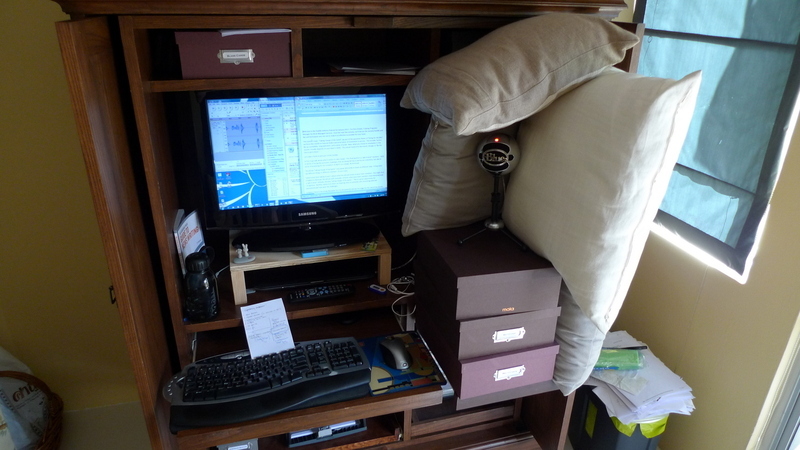 My previous arrangement was to use a stack of throw pillows, carefully balanced, to try and reduce the noise. Not only was this prone to collapsing in the middle of a recording session, but it also didn’t do a very good job reducing the noise. 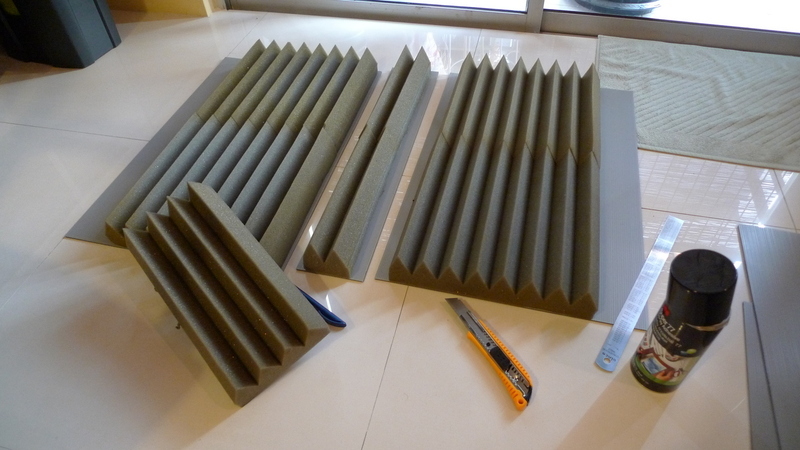 Over the past few months I had tried to source acoustic foam panels here in Bangkok, an elusive product that exists but nobody actually seems to sell. Finally, after going to a high-end audio shop that I had been told would have the foam, an employee there told me to go to the Ban Mor district near Chinatown. “That’s where everyone gets everything,” he explained. Ban Mor is about two blocks of a small soi, or alley, located across from the Old Siam shopping center. I go there all the time with Tawn but never realized we were literally across the street from the electronics district. Going from shop to shop on the crowded street, I finally located a speaker store that sold sheets of acoustic foam. Truth be told, this foam isn’t the same high-density acoustic foam that I originally had in mind. But it is dense enough to do the job and was not too expensive. I brought the sheets home along with some plastic fiberboard then started constructing the acoustic screen. The idea was to measure carefully so the the two panels would hinge closed with the foam fitting together like crocodile’s teeth. This way, it folds up flat, allowing for compact storage when not in use. After about an hour’s work, I had everything fitting together neatly. The noise reduction is much better than the pillows I was using before and I don’t have any problems with them collapsing mid-recording. One more thing I did to improve the quality of the recordings was to purchase a better quality microphone. Previously, I was using basically any random microphone you could plug into your computer, just like the ones you might use to talk on Skype. After some research, I settled on a Snowball USB microphone from Blue Microphones. This condenser mic has both omnidirectional and cardioid modes and produces professional quality sound. 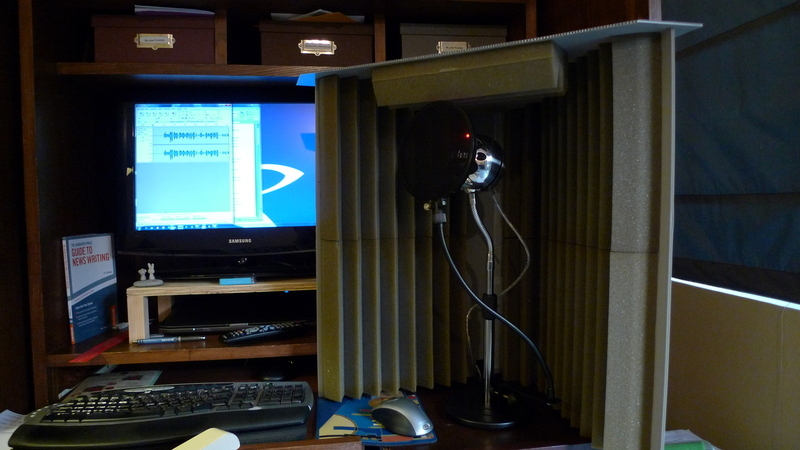 Pairing that with a pop screen and the acoustic screen and my recordings have improved many times over. Another project checked off the list! This entry was posted in Uncategorized and tagged Acoustic, Audio, Blue, Foam, Home, Microphone, Panel, Project, Recording, Screen, Snowball, USB by christao408. Bookmark the permalink. You are a Jack of all trades. You know your food and your a handy man as well. Good for you Chris. I am glad you solved that problem with such ease. Wow, that’s dedication. So professional! well I think you could have bought noise cancelling microphones but then I never have tried recording or using it so don’t know what I am saying.but this idea is spectacular – I will check this if it is here – why not stack them up in the never opening windows of my room to finally keep the unwanted noise coming in when listening to soft music? a question: do you think if I make 2 card board sheets of the size of my windows stack this foam inside and fix them from inside it will create enough vacuum to keep the sound coming in? Wow. You are a handy man! You are such a handy man! lolHappy New Year to you and Tawn! I personally liked the first version better. It was more McGyverish! Good job, Chris 🙂 Nice to see someone doing something practical.